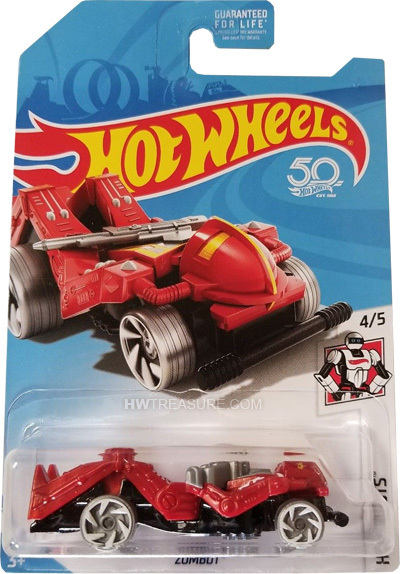 FKB32 is a 2018 Treasure Hunt and 4/5 in the HW Robots series. The vehicle is red with yellow and white graphics. 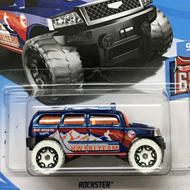 The low production symbol is on one knee and the Hot Wheels logo is on the other. 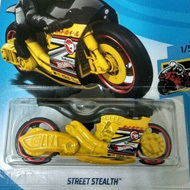 It has a gray weapon, gray RA6 wheels, and a black metal base. The Zombot made its debut in 1987 in the Speed Demons series. It is an original design of a robot that can stand or roll on its back.